1 Federal Census, PA, Allegheny County, 1940, Pittsburgh, E.D. 69-363, Sheedt 4B, Image 8 of 26, Ancestry.com (Online Census Images). 2 History of Pittsburgh and Environs, New York and Chicago: The American Historical Society, Inc. (1922), 138, Google Books (Digital Library). 3 WWII Draft Registration Cards, Draft registration for spouse Christian Hax McCullough, fold3.com. 4 Roberts, Gary Boyd, Notable Kin, Volume 1 , Santa Clarita, California: Carl Boyer, 3rd (1998), 21. 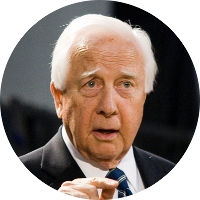 5 Wikipedia, "David McCullough", (accessed 07/03/2017).